The Zurich Oberland includes the Zurich districts of Uster, Hinwil, Pfäffikon and the Middle Töss Valley in the district of Winterthur. The region borders with the agglomerations of Zurich and Winterthur and may be easily reached either individually or by public transport. The area around the Greifensee and the Lake of Pfäffikon is flat or slightly undulating, often characterized by protected moorlands and drumlins. Further east are the mountains of the Zurich Oberland: Bachtel mountain (1115 meters above sea level) in a first range of hills, the Schnebelhorn (1292 meters above sea level) and the Hörnli (1133 meters above sea level) further back on the border to the Canton of St. Gallen. 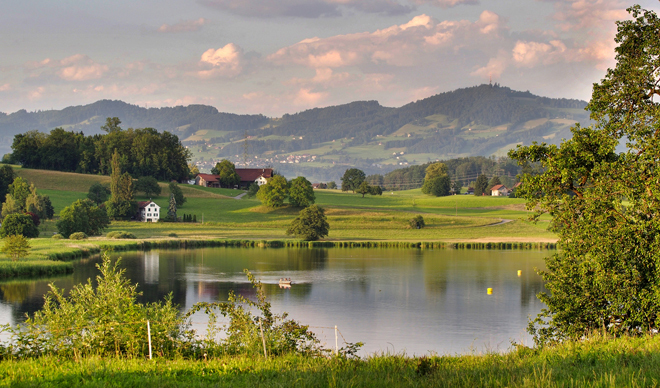 From these excursion points that are popular with hikers and bikers, you may enjoy the magnificent panorama of the Alps, Lake Zurich and the Zurich Unterland as far as Lake Constance and Säntis mountain.